Heat oven to 350°F. In 12-inch skillet, heat oil over medium-high heat. Cook white onion and garlic in oil, stirring occasionally, until tender. In blender, place cooked onion and garlic, the bean soup, broth and bouillon; cover and blend on low speed until smooth. Pour mixture into same skillet; stir in epazote. 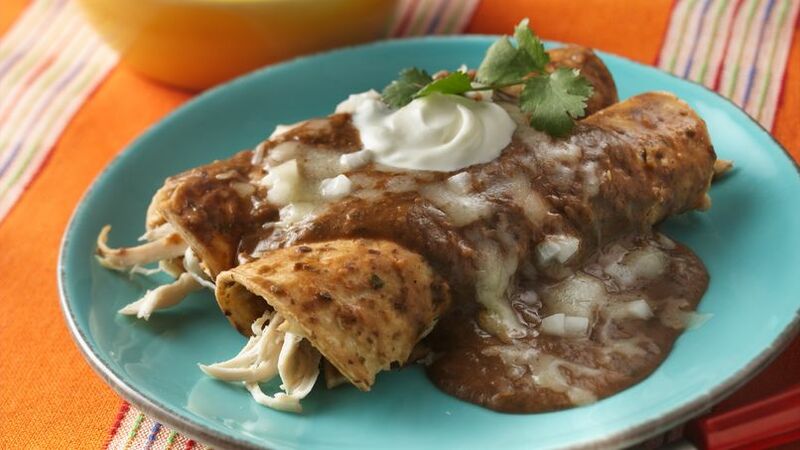 Keep warm over medium-low heat while making the enchiladas. Wrap 4 tortillas at a time in microwavable paper towels. Microwave on High 20 to 30 seconds or until they can be folded without cracking. Dip each tortilla into bean mixture until coated. Top each tortilla evenly with chicken; roll up. Place in 9-inch square or 11x7-inch (2-quart) glass baking dish. Pour remaining bean mixture over enchiladas; sprinkle with cheese and onion. In small bowl, mix sour cream and whipping cream until blended; pour over enchiladas. Bake uncovered 15 to 25 minutes or until thoroughly heated. To substitute for the Progresso® black bean soup, increase the amount of chicken broth to 1/3 cup and use 2 cans (15 oz each) Progresso® black beans, undrained.